Lavazza, the iconic Italian coffee brand, today announced the launch of Il Mattino Vivace, its first Made-In-India-For-India premium pure filter coffee. Il Mattino Vivace, which translates to the lively morning, is a real filter coffee for the At Home segment made from beans sourced from the best plantations in Coorg and Chikmagalur in the Western Ghats of India. Made with a fine blend of Arabica and Robusta beans, Il Mattino Vivace is a balanced coffee powder rich in flavour. The beans are roasted to perfection in medium to dark for level 6 intensity, this mild and aromatic coffee has a well-rounded body and perfect hints of caramel notes. 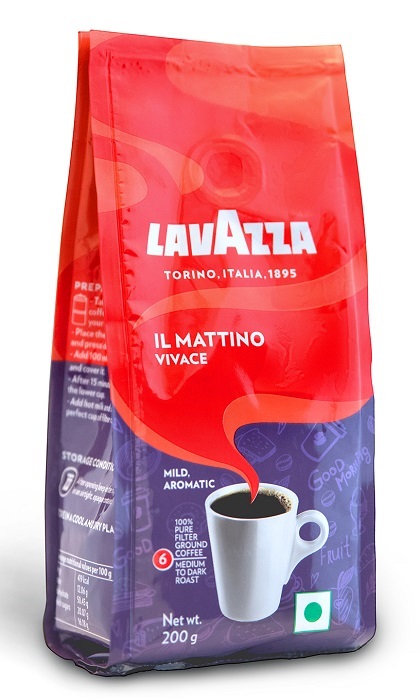 Lavazza Il Mattino Vivace comes in a special airtight packaging with innovative freshness intact valve which preserves the aroma of the powder for up to 12 months. Available in leading modern retail outlets, it comes in packs of 200 grams and is priced at Rs. 150. Perfect to enjoy with milk preparations, Il Mattino Vivace can be used on South Indian coffee filters, moka pots and electric coffee machines. Luigi Lavazza S.p.A., the Italian coffee major entered India by acquiring Fresh & Honest Café Limited, India’s leading coffee, vending and retailing, company in 2007. Fresh and Honest Café Ltd is a 100% owned subsidiary of Lavazza, which is one of the leading Coffee companies in the world, operating in away from home channels – HoReCa, Corporate Offices, Vending and has significant presence in the premium modern trade space. In the home segment apart from Il Mattino, it offers Qualità Rossa, Crema E Gusto, Club, and Caffè Espresso. The company has a coffee Training Center in Chennai where it trains excellent professionals, carries out research into obtaining unique and perfect espresso quality and explores new forms of taste. Its world class manufacturing facility is located in Sricity, near Chennai.